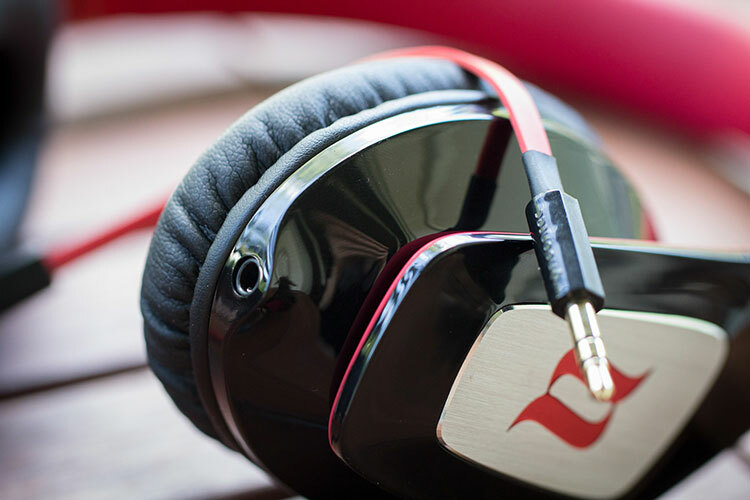 The Noontec Zoro II HD is a consumer oriented portable closed on-ear fashion headphone that wants to question the popular Apple Beats price tag. There is no doubt that the design is similar to the original Beats Solo so I will jump right into aesthetics to talk about the huge elephant in the room. The Zoro 2 headphones have found their way to me via an Amazon gift code, which left little choice about the color of the headphones. The updated Zoro headphones come in Sapphire, Rose violet, Pitch black and Pearl white. My pair in Pitch black features a combination of black and red that I would say has almost become a trademark for Apple’s newly acquired Beats by Dre. The recently updated Solo 2 have facelifted the original design so the similarities luckily aren’t as close as they could have been. The Zoro II HD are closer to the original Solo, also in regards to build quality, whereas Beats by Dre have advanced considerably. The ear cups of the Zoro are shaped differently, though. 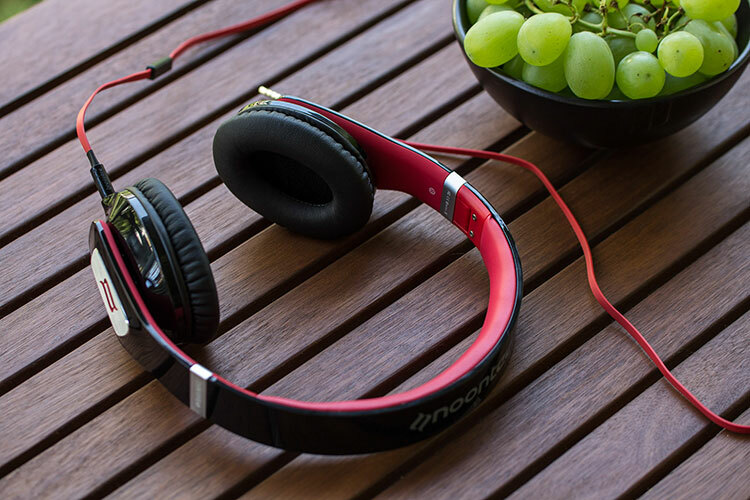 Instead of the fully round cups from Apple, Noontec has matched the shape closer to the form of an oval ear. The glossy plastic material, foldable design, padded inside and removable cable all strike resemblances, though. As Noontec market these as “Fashion Hi-Fi Headphones” I feel like I have to be a bit more judgmental in regards to looks. 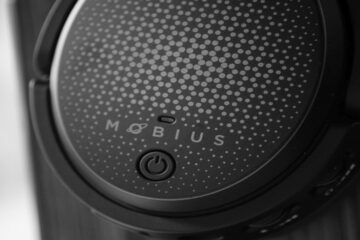 Aside from the brand logo that’s embossed into brushed aluminum, there is too little that sets it apart to actually present something new. I just don’t feel like glossy plastic is justification enough to claim a better sense for fashion than other headphone manufacturers do. I hope Noontec reads my review and values my input because I think the potential is there. But instead of going for a design that already has been accepted by many, I think that something new should be brought to the table. I am sure there are many motivated startup designers that can come up with an original design. Going by the form alone, I like how the headband extends over the ear cups and the oval shape is an improvement over the fully round cups of Beats. Unfortunately I also have some gripes about the build quality. Priced at 99$ or 89€ it’s obvious that one cannot expect a premium build quality, but there is still a bit too much room for improvement for my taste. For example, the red colored and embossed Noontec logo on one side has the red color overlapping, the lettering “Designed in Italy. Made in China by Noontec.” on the inside of the headband has an unintentional tilt, the supraaural cups squeak when they move and when the headband folds the crack noise is very loud. You can also hear the dynamic driver click from the pressure compensation after you have a seal. In all fairness, not everybody looks at a product as if he had a magnifying glass like I do, but I do fall in love with gadgets at times and it’s usually the details that tip me over. But even if you look as closely as I do, these minor flaws are nothing that will keep you from using the headphones. But personally I’d be willing to pay 20-30% more if this were not the case. Ideally, the build quality would be improved without raising the price considering that for the same price you can get Marshall’s Major, for example. As with most “fashion headphones” the design does not focus on replaceability of spare parts so the cushions sadly seem to determine the longevity of Zoro II. I do like the removable flat cable with one button and microphone. It seems very durable but it’s also soft. As for comfort, I have little to criticize. It’s a very lightweight design and easy to wear. However, I do believe that the cups should swivel far more. I can feel considerably more pressure on the back of my ears than in the front because the cups mostly remain flat on my angled ears. I cannot see how this would have been a difficulty to implement and eventually it was a detail that bothered me. The packaging is quite nice with a magnetic cover to reveal a window and the headphones are printed glossy on an otherwise matt card box. I’m not a fan of advertisement with meaningless terms like “HD High Definition” or trademarks that are there for marketing purposes only. What is “Surround Closed Cavity Body” supposed to mean? I googled it and found nothing except for the Noontec headphones. Basically it means ‘closed headphone’ with a split diaphragm and renamed parts and somebody went through the trouble to add a TM to it, probably for the package. I think a more minimal approach with less tags would boast more confidence and also look classier, but I could be wrong and perhaps this does actually help to increase the market share. Inside the box you will only find one accessory: a black flannel bag to protect the headphones from scratches. I am accustomed to finding a 6,3mm adapter in every box that says “Hi-Fi” but in this case I also don’t see how it would have been necessary. However, I don’t see the strength of Zoro II HD within the overall design, presentation, build or comfort but in the driver tuning. The Zoro II HD has an extremely well tuned driver. Noontec have created a sound that is very suitable for the ambitious consumer. I have been using these headphones a lot in the past three weeks and never had I wished for a different tuning or noticed any bothersome coloration. The Zoro II HD is freed from any fatigue but also neither lacks extension nor any frequency ranges. 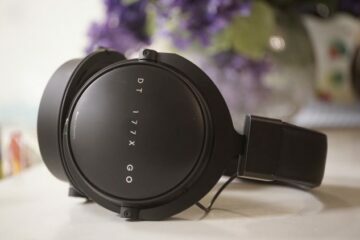 This pair proved to be a very good all-rounder that is gladly welcomed among an over-abundance of warm, bass-heavy and strongly balanced consumer headphones. The bass is flat and extends deep. There is no emphasis on boom, slam or punch – Zoro’s bass quantity will adjust nicely to the recording. The bass is not especially detailed though and higher priced headphones reveal better texture more often than not. However, this is a great performance nonetheless to dive straight into the music. As with the bass, the mids perform equally well. There is but little coloration with female vocals that give a little softness to higher notes, but overall the sound is very natural. I like how voices and guitars are not analytical in the slightest, yet there is no bass bleeding or bloat. Coming from the Beyerdynamic DT1350 as an on-ear reference headphone, I do miss some better separation and some slight emotional cues in Jazz vocals might go unnoticed. Overall, the performance is quite solid though. Highs are slightly recessed and are responsible for Zoro’s smooth presentation. They are fairly flat, however, and don’t have any tendency to emphasize sibilants at all. They come together with the mids extremely well. For a sub-100$ headphone one cannot expect Tesla precision, obviously, and I couldn’t improve resolution by switching to a powerful amp either. A smartphone like my iPhone 6 does not seem to be a bottleneck if you are willing to squeeze out the ultimate performance. I have also switched cables with the Solo 2 Crosstalk cables and Logitech UE9000 headphones without noticing any difference in the performance. The Zoro II HD are not meant to be monitoring devices and the focus lies on that the overall presentation of music comes together very well. However, if you are willing to squeeze out every bit of resolution for your money, these might not be the perfect choice. Every on-ear headphone is challenged with the task to portray a wide soundstage and the Noontec Zoro II HD are no exception. Due to the core design the soundstage is fairly small and I sometimes wish that vocals had more space around them. Imaging is not bad, though, and instruments are layered nicely as long as you do not expect reference performance. Page 2: Da Beats shout out! I found both headphones useful as portables, but for indoors hi-fi listening – no. The Zoro-II treble is recessed from average hi-fi (say, HD800 minus 3-4 db) by 9-10 db, which is too much for indoor listening. I found the Solo2 to be brighter, but it takes a 10 dive from about +5 around 4 khz to -5 at 8 khz, so it’s too uneven for listening in quiet places IMO. Granted that the Solo2 is a deluxe package and build, I didn’t find anything offensive about the Zoro-II. Maybe my expectations were low, but I didn’t find anything that bothered me, as I have found with other headphones such as the $200 Music Hall DeBe. I reviewed the first Zoro a few years back and found them far better audio wise than I was expecting also, my expectations where low also.